I love pushing students to explore the 2013 controversy, when Disney set forth to trademark the term “Day of the Dead”. With beginning level students, I use authentic English texts like those from CNN, The Flama, LA Times, etc. (lots more via Google search!). I am ok with using English texts because it is a cultural activity and students can get through the material more quickly in English, this is a "mini" activity after all. I've had students work in small groups to read the articles collectively, or each individually, and then summarize together with a jigsaw structure. 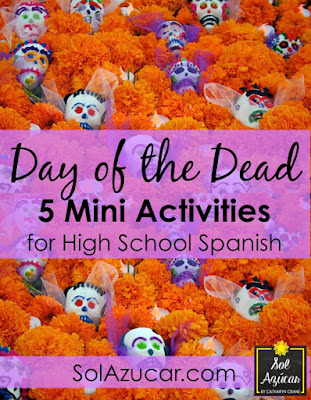 This activity is especially fun, as the Disney movie Coco is slated to come out next year. This 2014 animated feature is so beautifully done and a great way to informally learn about the holiday in a fun way. Consider offering an extra credit opportunity outside of class for students to watch the movie and submit a 1 paragraph written review of the film. Or offer an after school movie showing in your classroom - make pop corn, move the desks out and lay down blankets, so students can watch the film together. Or if you have time to show the film in class, or even to show the trailer, it could prompt a meaningful discussion about the nature of this holiday, important practices, symbols, and the history. Glyphs are a fun way for students to read in the target language, while creating their own unique “glyph” or symbol that conveys unique information about a given student in a purely visual form. I have students create their own glyph using a simple Day of the Dead image that one of my (artistically gifted!) old students drew for me (see my pic below). They read through the Spanish-language prompts to select the colors that best describe them and then color in their glyph accordingly. These make for a really lovely bulletin board! I’ve also extended the activity on a second and even third day with another "mini" activity - having students work in pairs to interpret their peers’ glyphs. What does your glyph say about you? 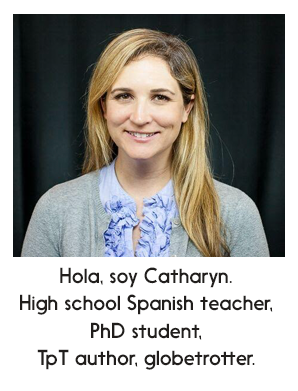 They then describe their peer in the target language verbally or in writing. I sell these in my Teachers Pay Teachers store, but you can easily make your own versions using simple language prompts! Students are responsible for writing their own definition and/or creating a visual to accompany each term. They can submit these at the end of the 10 days for extra credit or as a graded assignment. This is an easy bell work prompt, fast finisher activity, or way to fill in if you find you have extra time in a given class period. I’ve had students get quite creative with these, taking funny photos to depict the words, using creative handwriting to draw out the term, etc. Consider offering even more points or an extra incentive like an award for the most creative submissions, in order to inspire unique work. Have students submit work in a notebook, digitally, through your class' social media page or by using your hashtag, or even have them make larger visuals and use them to create a bulletin board. Lots of possibilities! How might you modify these activities to work for your students and classrooms? I always love to hear your ideas! The day of the dead me app seems weird-it's asking to put in a birthdate and you have to be over 21 to use it. I also can't get all of the designs that you did, is it the paid version you used?